First Line: The tower reached high into a gray sky. Mel Turner and her construction crew have been hired to renovate a historic lighthouse on an island in San Francisco Bay. Mel's friend Alicia intends to turn the property into an inn, and although Mel has never attempted such an ambitious project, she can't wait to get started. 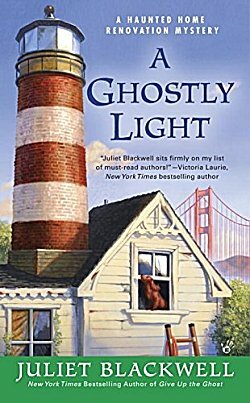 This is another solid entry in one of my favorite cozy series, made even more special because I love lighthouses and the accompanying keeper's houses. Blackwell always handles the supernatural elements in this series well. She doesn't overdo it. The ghosts Mel sees aren't just there to provide chills and thrills; they honestly have something to do with the mystery, and that's something that I appreciate. Mel is a character whom I enjoy coming back to again and again. Smart, funny, capable, she's just as good at solving mysteries as she is at renovating old buildings. (That "renovating old buildings" is another reason why I enjoy this series.) Mel not only heals old buildings, she heals people as well, this time a domestic abuse victim, Alicia. If you enjoy light mysteries with characters who make you smile, if the occasional appearance of a ghost doesn't bother you, and if you consider learning some of the history of the San Francisco area, I highly recommend Juliet Blackwell's Haunted Home Renovation series. It's good. I really do need to try this series, Cathy. Lighthouses are really interesting (and beautiful) settings, and they're unusual, too. Mel sounds like a good character, too. I enjoy this series too. I, also, like the part in her family's kitchen with her dad cooking. Not all members eating are related,(in fact most of them are not related) but are included as family. Her dad is always willing to add another plate. Dog is always there too. Yes, I really enjoy the family elements, too. Thanks for bringing them up, Lynn.